While large section of Muslim masses openly support Anna Hazare's anti-corruption drive, several Muslim clerics, community leaders and intellectuals have expressed reservation about the nature of movement. The first to openly voice his dissatisfaction with Shahi Imam Ahmed Bukhari who questioned the association of right-wing forces in the movement. Bukhari had also criticized the open chanting of jingoistic slogans like Vande Mataram.After Team Anna met him, Bukhari said that he could reconsider his position if Hazare clarifies his stand over the latter's praise of Gujarat's chief minister Narendra Modi. But the Imam is not alone in voicing his concern over fears of RSS infiltration in the drive for Lok Pal bill. Social activist Shabnam Hashmi on Tuesday questioned where Hazare was when North Indians were attacked in Maharashtra, when Christians were burnt in Orissa-Karnataka, Muslims persecuted in Gujarat and fake encounter staged in Batla House. She said that those who are raising Gandhian slogans were missing then from the scene. Hashmi said that a vast majority of those present in the agitation have no clue about Lokpal or the implications of having such an ombudsman in the country. The president of All India Muslim Youths Anti-Terrorism Front Shakil Saifi said that Hazare was never heard when Mumbai burnt in communal flames or when Muslims were killed in communal riots in Gujarat. Saifi said that Anna imitates Gandhi but unlike the Mahatma, Anna's team has no Muslim. On the other hand, hundreds of Muslims under the banner of All India Pasmanda Muslim Mahaz, burnt effigies of Ahmad Bukhari, to protest his statement. 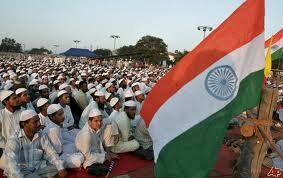 Clerics and Imams in different parts of the country have supported the agitation and said that any step against corruption is sanctioned by Islam and thus Anna must be supported.